The GhostBed competes head-on with several other online mattresses in the same price range. How does it compare in terms of support, features, and warranty? Note: Although the GhostBed is a relatively new entrant in the online mattress market, the company behind, it, Nature's Sleep, has been in business for more than 15 years, and was one of the first companies to sell mattresses compressed and rolled into a box instead of fully expanded. This review is for the original GhostBed mattress. The company has also introduced the GhostBed Luxe, which we have also reviewed. If you’d prefer to watch rather than read, check out our full GhostBed mattress video review above. GoodBed's Take – Who is the Best Match for a GhostBed Classic Mattress? The GhostBed Classic is an 11-inch all foam mattress with three types of foam: gel memory foam, synthetic latex foam, and polyurethane foam. Like most mattresses available exclusively online, it comes shipped to you via common carrier, compressed and vacuum-packed into a box. The company that manufacturers the GhostBed mattress, Nature's Sleep, was one of the pioneers of this type of shipping method, which has completely changed how people can buy mattresses today. Nature Sleep has been in business more than 15 years, longer than most companies selling mattresses on the internet. The GhostBed has a lot of competition in its price range (currently $895 for a queen size bed, before any GoodBed discounts), so how does it stand out in a crowded field? The quality of the foams used in the GhostBed mattress are a cut above the competition in our view. The top layer of gel-infused memory foam is a 4 lb. density, higher than most of the competition in this same price range. You also get a layer of premium synthetic latex that's continuously poured, meaning it's similar to natural latex and is unlikely to crack or flake (and that would be covered under the 20-year warranty). Lastly, the support block of polyurethane foam is a 2 lb density foam; that's a higher density (better quality) than typical 1.8-lb. density foam we see on competing mattresses. In our testing, the GhostBed proved very supportive for back sleepers in particular. Our tester felt the bed did a very good job supporting his lumbar area, almost reaching up to support the more concave areas of his back. Ease of repositioning was also a highlight in our evaluation. Moving from position to position was almost effortless. Edge support was also very good, important if you like to sit or lay directly on the side of your mattress. Foam bed often don't do a great job in this respect, but our tester felt very stable on the GhostBed mattress. Motion isolation was also very good. That could be a priority for you if you are easily awakened by a partner's movements. But the overarching highlight in our view was value. At $895 for a queen size mattress, the GhostBed uses premium materials that we think we hold up very well over time. This is supported by the company's 20-year warranty against defects, which includes cracking of any foams, and body depressions greater than one inch. Among our concerns with the GhostBed: All foam mattresses aren't usually the best choice for those who tend to overheat in bed. Although the GhostBed does have a few features to help with heat dissipation, this just isn't a strength of foam beds in general. We also wondered whether people that are significantly heavier than our tester would have trouble with pressure relief, sinking through the 3.5" of premium comfort foams and 'bottoming out' on the harder support foam, which will be much less conducive to pressure relief. Those much lighter than our tester might have the opposite issue; they might not be heavier enough to sink deeply enough into the foam and create good spinal alignment. But overall, we thought that the GhostBed would suit a wide variety of sleepers, at a very competitive price. Read on for our detailed report and be sure to check out the video to see this mattress in action as we put it through our tests. You can always visit the company's website for more on the GhostBed. The GhostBed mattress includes three types of foam stacked together. At the top, you have 1.5 inches of synthetic latex. While not made of natural rubber, the latex looks and behaves very similarly to natural latex. It is pierced throughout with pin core holes, which occur as part of the manufacturing process. After that there's a 2-inch layer of gel-infused memory foam. The gel flecks are intended to help with the dissipation of heat, since gel is a proven conductor. The memory foam is a 4-lb. density foam (foams used in mattresses typically range from about 1.5-lb. to 5 lb. ), a higher density (and higher quality) than many memory foams in competing beds (3-lb. or 3.5-lb. is more common). The top two layers are 3.5-lb density foam, making them softer and more pliant than the more supportive layers below. Most of the softness aspects of the Casper bed come from those top two comfort layers of foam. You’ll note that the numbers above don’t quite add up to 10 inches; the last .5 inches of height can be attributed to the mattress’s cover. The three layers of the GhostBed mattress are wrapped in a soft and stretchy cover. If we had to nit-pick, we would say that the quality of the side panels seems not quite up to par with the rest of the materials used in this mattress. We classify the GhostBed mattress as a Medium Firm mattress, just to the firmer side of medium. The feeling you get is more of a floating-on-top sensation versus sinking deeply into the mattress. This refers to how deeply you sink into the mattress or feel cradled or hugged, versus a feeling of floating on top of the bed. This is definitely more of the latter. Our lying on top of the GhostBed, felt cushioning was a bit shallower than some competing mattresses with deep pillowtops and plush top layers. 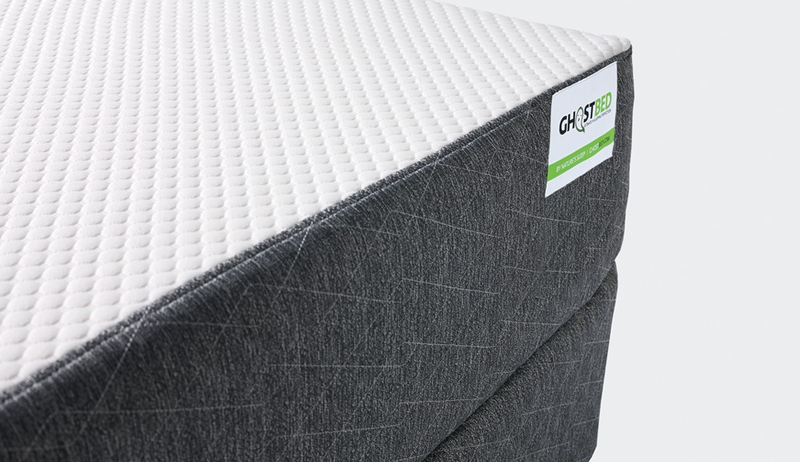 If you like that feeling of being more independent of your mattress rather than being snugged in by it, we think you’ll like the GhostBed mattress. The GhostBed mattress does have a 2” layer of memory foam (the second layer of the mattress), it really does not have that much of that recognizable memory-foam feel, where after compressed, your hand print takes several seconds to disappear (some describe this as a slow, melting into the mattress feeling). The top layer of latex counteracts the effect of the memory foam so what you get is a sort of middle ground, with a little of that memory foam feel, but less than you would get if the memory foam was on the top. We also tested bounce, and like most foam mattresses, this is not a bouncy bed. In our evaluations, the GhostBed offered very good back support, and we thought it would suit a wide range of people of various sizes and weights in the back sleeping position. Support while side sleeping was also good for our tester. 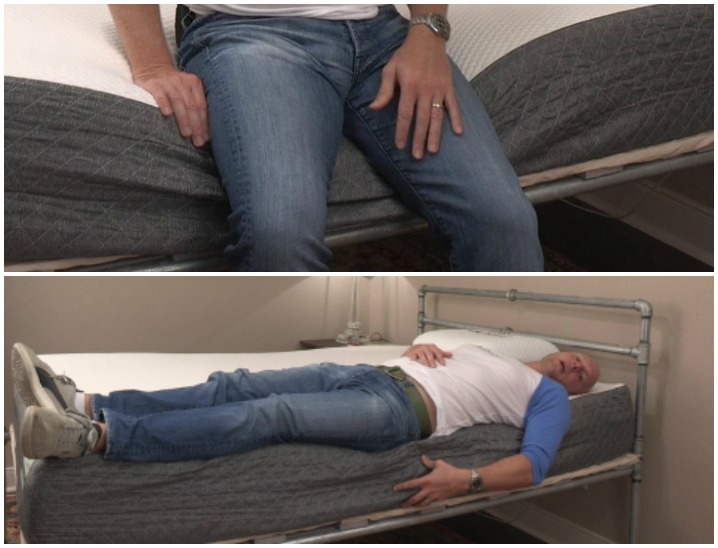 While our tester was on his back, he noted that his hips sank just deeply enough to create a perfectly neutral spine, while he felt the GhostBed mattress did a nice job reaching up to support his lumbar curve. We feel that sleepers of a wide weight range would have a similar experience, and we did not have concerns that heavier sleepers might not be supported enough. Things were less clear when we evaluated side-sleeping. For our 200-lb. tester, side sleeping was good. His hips sank well into the mattress, but he wished his shoulders would have sank a bit more. But for most people of average weight in that 125 to 200 range, we felt back support and spinal alignment would be good. We did question whether lightweight people would compress the foam enough to create good spinal alignment, and at the same time felt those who are much heavier than our tester might sink right through the comfort layers of the bed to rest on the harder foam beneath. Overall, we found the pressure relief offered by the GhostBed mattress to be good. 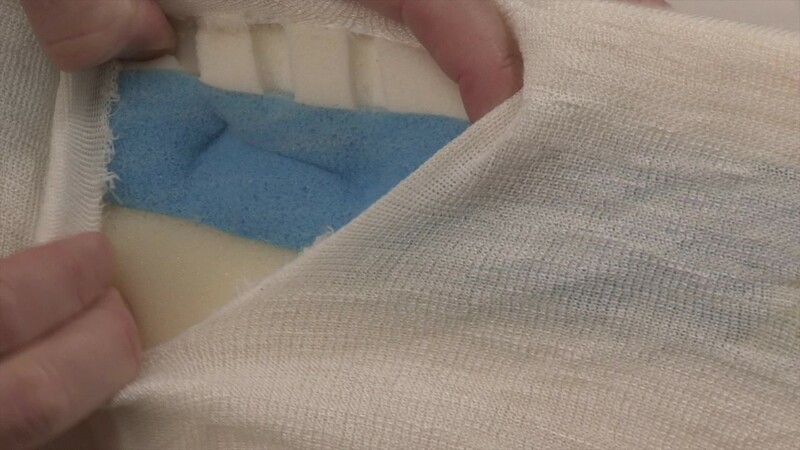 Our tester didn’t experience any specific issues, and he didn’t feel that he ‘bottomed out’ or pushed through the mattress’s comfort layers and into the firmer support foam layers. However, we do wonder about heavier or curvier people, whose hips and shoulders could possibly sink through those top layers to the harder support layers of foam. And those who are very light might find this medium-firm bed too firm. With a bowling pin standing upright on the GhostBed, we tested motion isolation by pressing down hard on the mattress, as well as with whole weight of our 200-lb. tester. When we pressed down repeatedly on one side of the bed, the bowling pin really didn't move much, and we suspected the little movement we did notice could be attributed more to the bed frame than to the mattress. When our tester dropped his entire weight onto the GhostBed mattress, the pin barely moved. We only made the pin fall by rolling around right next it. We felt that the GhostBed bed would be a good choice for couples who don’t want to feel their partner getting in and out of bed. Memory foam has a reputation for heat retention, but in the case of the GhostBed mattress, the memory foam layer is not on top. The memory foam is also infused with gel, which may help conduct heat away from the body since gel is a natural conductor. And because the GhostBed is a firmer bed, your body doesn’t sink so deeply into in, leaving more of your body exposed to air and able to dissipate heat. If overheating in bed is an issue for you, and you’ve experienced it with other mattresses, other models have features that are specifically intended to address this, but for most we don’t expect heat to be a problem with the GhostBed mattress. Foam mattresses aren’t typically very supportive along the very edge of the mattress—important if you like to sit on the edge of the bed, or if you tend to sleep along the edge. Our tester felt very stable both sitting and laying on the edge of the GhostBed mattress. Edge support might not have been as good as with an innerspring mattress, but for a foam bed, the GhostBed was very good, we felt. One of the highlights of the GhostBed mattress, for our tester, was ease of movement, which owing to the high responsiveness and elasticity of the latex layer, was almost effortless. If you tend to change positions a lot, the GhostBed mattress performed extremely well in our view. In the case of the GhostBed mattress, the company makes no claims about the use of natural materials, and the latex is synthetic, not natural. However all of the foams used are certified to the CertiPUR-US standard, which verifies that a material has low VOC off-gassing as well as a lack of chemicals and other substances regulated by the CPSC. GhostBed has a page on its environmental policies. We did not specifically test the GhostBed mattress with an adjustable base. However, the company sells its own adjustable base that can be used, and using an adjustable base (either GhostBed’s or another brand’s) will not void the warranty. Since the company endorses use of adjustable bases, we assume that compatibility is likely good. The GhostBed is an 11-inch mattress made of polyurethane foam, synthetic latex foam and gel-infused memory in densities we would describe as higher than average among competing beds in the same price range. Overall, you are getting 3.5" of premium comfort material (the memory foam and the latex). When it comes to estimating the comfort lifespan of a mattress, we tend to use foam density as our best, albeit imperfect, predictor of how long a foam will retain its shape and resiliency. In the case of the GhostBed mattress, the foams used are above average, and in our experience, higher density foams are less likely to compress, become misshapen or crack. We saw no red flags with regard to how long we think this mattress will last. Pricing for the queen size GhostBed is $895, a price that’s right in line, or even a little less, compared to other all-foam mattresses sold exclusively online. Compared to similar mattresses found in a traditional store, we think the GhostBed is an incredible value, and even compared to the online competition, we think it stands apart in terms of value for the money. GhostBed includes free delivery, which is not particularly unusual among its competitors. The GhostBed comes in a big box; the queen size mattress weighs 89 pounds, so carrying it to your bedroom is a two-person job. Summary: Is the GhostBed Mattress Right for You? The GhostBed mattress is an excellent value, given its premium materials for the money. Here’s who we think the mattress is best for, based on our evaluation. Is the GhostBed mattress right for you? Take our Mattress Match Quiz to find mattresses that fit your needs, based on your preferences and price range. Looking for more on the GhostBed mattress? Visit GhostBed.com. Is the GhostBed Luxe really the "coolest bed in the world?"